Outer Burial Containers, sometimes referred to as vaults, are required by most cemeteries in the region. Their function is to support the weight of the earth to help prevent sunken graves. Years ago these concrete containers were not used or required. If you are in older sections of cemeteries, generally you will notice that the ground is very unlevel. This is because what has been buried has deteriorated such that the ground has caved in. The outer container may also function as a protector and keep elements at bay according to manufacturing specifications. There are three levels available in the outer burial containers: Basic, Standard and Premium Protection. You will find different containers in each level and can be viewed below. These premium burial vaults provide excellent durability with superior long-lasting protection against subsoil elements and the weight of heavy cemetery maintenance equipment. The Wilbert Bronze® provides ultimate triple-reinforced protection. The Bronze and Copper Triune® series vaults provide double-reinforced protection. All premium protection products come standard with the Memorialization Plus™ feature and can be personalized with Wilbert Legacy Series™ prints, Wilbert Legacy Custom Series™ prints, Personalization Plus™ or Life's Reflections® appliqués. The brass Memorialization Plus capsule stores a personal message to the loved one and a vital identification scroll in the carapace of The Wilbert Bronze® and Triune® series burial vaults. High-strength concrete, stainless steel, and plastic combine for durable inner protection in our middle of the line, double-reinforced products. Double-reinforcement provides the casket with superior long-lasting protection against subsoil elements and the weight of heavy cemetery maintenance equipment. All Triune® series burial vaults come standard with Memorialization Plus™ and can be personalized with Wilbert Legacy Series™ prints or Life's Reflections® appliques. The brass Memorialization Plus™ capsule stores a personal message to the loved one and a vital identification scroll in the carapace of The Wilbert Bronze® and Triune® series burial vaults. Basic protection products are single-reinforced and feature concrete construction combined with plastic-reinforcement for strength. Provides casket with protection against subsoil elements and the weight of heavy cemetery maintenance equipment. A memorial service with ground burial offers family and friends a meaningful opportunity to thank and honor an extraordinary life. 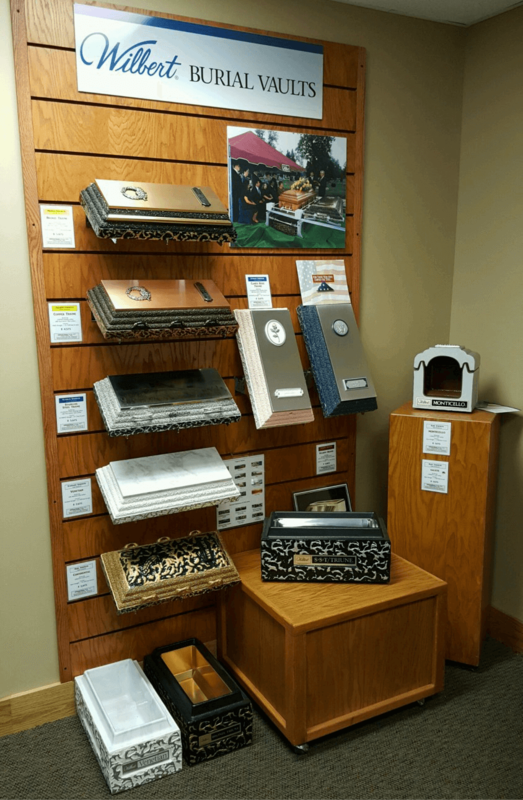 Wilbert offers multiple ways to personalize a burial vault with words, symbols, and images that speak of a singular spirit.